The Philips 245C7QJSB is one of the brand-new Philips monitors from the Moda Slim C-Line series. Its main weapon lies in its beautifully thin design and in its IPS panel that covers a wide range of the color gamut, up to 106.5% of the NTSC (CIE 1913) color space. This monitor will also be available as a 27-inch version and as a 32-inch once it’s released sometime in February 2017 for around $270. Until then, we’ll have a look at what it will offer and its specifications. It’s also known by the name Philips Moda 245C7QJSB. 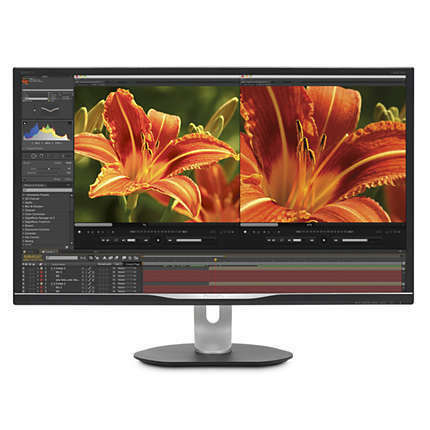 The Philips Moda 245C7QJSB will feature an IPS panel that will cover over 100% of the sRGB color space making it an ideal monitor for the professional designers, photographers, and alike. The picture quality won’t only appeal to the designers but to the everyday consumers as well, due to the numerous convenient feature that this sleek monitor will offer. The IPS panel also ensures the impeccable viewing angles of 178 degrees both horizontal and vertical as well as a quick response time of only 5ms for minimal ghosting of fast moving objects. One of the most promising features of the Philips 245C7QJSB is the SmartImage. This feature will allow you to swap between several pre-calibrated presets according to your activity on the screen. These presets include Office, Photo, Movie, Game, Text, LowBlue Mode, and Economy. By setting one of these presets, you will be applying calibrated settings of the SmartContrast and SmartKolor features which can also be individually modified in the OSD settings. SmartContrast feature analyzes the displayed content and adjusts the contrast and backlight intensity accordingly while the SmartKolor feature enhances color saturation and extends the visual color range for a superior color and image quality. This way, the Economy Mode, for instance, will provide you with just right amount of contrast for a good picture quality while saving on power. The LowBlue Mode decreases the amount of the harmful blue lights which will along the flicker-free screen allow you to watch movies, play games, or work for hours without straining your eyes. The OSD joystick is placed behind the screen and can be used for easy navigation through the OSD menu. You can turn off the monitor by holding the joystick for 3 seconds, and turn it on by pressing it. While not in the OSD menu, the joystick can be used as a shortcut for adjusting the speakers volume, changing input selection, and swapping between the SmartImage picture presets. In the OSD menu, you’ll be able to adjust all the standard picture settings such as the brightness, contrast, sharpness, five different gamma modes, swap between widescreen and 4:3 picture formats, and choose between two different temperature modes, 6500K and 9300K. Additionally, you can modify the SmartKolor, SmartTxt, SmartContrast features as well as configure color levels of the red, green, and blue colors and choose between four different speed levels for the response time. 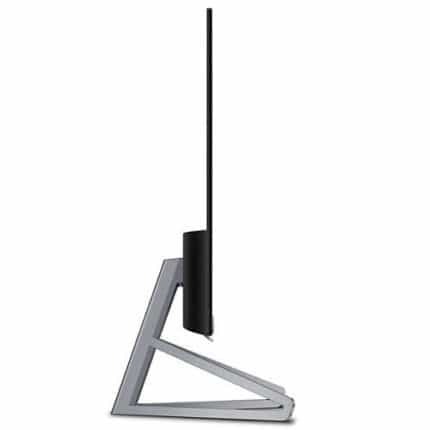 As you can see in the picture, the Philips 245C7QJSB features an ultra-thin design at only 5.2 millimeters. The black and gray colors along the glossy finish make for a modern look which is complemented by the borderless design. The bezel at the top and at the sides is only 2.5mm thick which is ideal for multi-display as the gap between the monitors will be minimal while the picture pops out. However, the way the ports are placed indicates that it’s not VESA mount compatible for wall or mounting arm installment. Furthermore, it can only be tilted by 25 degrees as far as ergonomics are concerned. The Philips 245C7QJSB will feature a VGA, DisplayPort 1.2, and an HDMI port with the HDCP protection. Additionally, it will have an audio line-out port, but no USB ports. The DisplayPort 1.2 provides up to 10.8 Gbps data transfer and up to 15-meter cables while the HDMI with HDCP (High-bandwidth Digital Content Protection) prevents illegal audio and video content copying. The Philips 245C7QJSB will cost around $270 once it’s released sometime in February 2017. 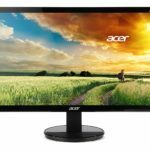 Although you could find slightly more affordable IPS monitors at this range, none of them feature such a sleek and thin design; moreover, this monitor boasts the ultra wide-color range that is unprecedented at this price point. The Philips 245C7QJSB is an excellent monitor for professional purposes, gaming, and everyday activities. It’s an ideal choice if you’re looking for an embellished version of the standard 24-inch, IPS panel, 1080p monitor as it will offer superior color accuracy and a more sleek design than any older monitors. The SmartImage presets are also something to look forward to, although most monitors with such optimized picture modes rarely impress, the features of the Philips 245C7QJSB seem quite promising. 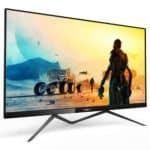 Overall, the Philips 245C7QJSB will offer you a great viewing experience for a reasonable price with some extra features and an awesome ultra-thin design. 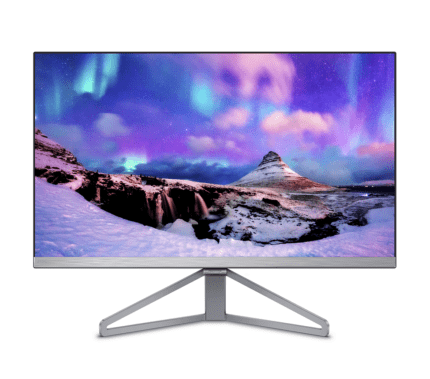 The Philips 245C7QJSB takes the standard 1080p IPS monitors to the next level with the extended color gamut, sleek and ultra-thin design, and some exclusive features. There is no doubt that this monitor will brighten up your desk space with its awesome design and exceptional picture quality.